After giving tours all this summer in the hot and humidity of Williamsburg, I have learned all about what I now will dub “the tour guide high”. No matter your mood, no matter the weather (thunder with lightning or 100 percent humidity), it is inevitable that tours make you be happy. 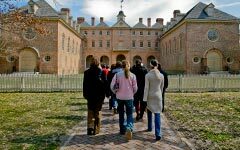 It’s great going to a tour in a bad mood, because after two minutes, it’s impossible to stay upset when screaming to a tour group about all the best things William & Mary has to offer. Whether it’s reminiscing about my favorite memory on the Sunken Garden (which was mud-sliding across it, TO THE CRIM DELL! ), or orientation (and how you really do make your best friends in those five days), by the end of a tour you’re ALWAYS SMILING and TALKING A MILE A MINUTE. It’s also great when people can tell that you have just done a tour. The other day, I met with a professor immediately after giving a campus tour. The second I walked in she called me out for being in “tour guide mode”. I still had a smile plastered to my face and was rambling on like a crazy person. My friends are also very in tune to the side effects of my tour guide high and tend to see me as overwhelming when I get home from walking backwards around campus. So in case you haven’t had the pleasure of the tour guide high, I’ll try to describe it for you. Usually it lasts for about 30 minutes after the tour. Side effects include: smiling nonstop, talking ridiculously fast, being jittery, and having your heart racing. Honestly, I love giving tours (and telling everyone how absolutely amazing our school is), but for me the tour guide high is just as wonderful as giving the tour itself.